Congrats in gold and black! 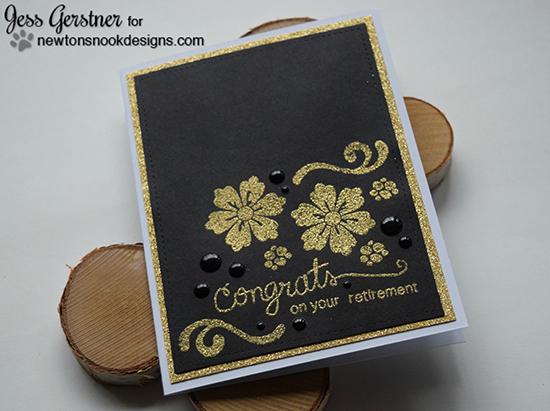 Today we are sharing this gorgeous retirement card by Jess! She used our fun bold floral blooms and flourishes from the Fanciful Florals stamp set and embossed them in gold on black paper! What a stunning look! She also created a custom retirement sentiment using our Simply Sentimental stamp set! The words "congrats" and "on your retirement" are part of all the mix and match options available in this set - it's a perfect set to have on hand to make cards for all the special occasions that you might need to make cards for! Gorgeous! A smart, sophisticated card to celebrate another phase of life's journey! WOW! Beautiful card! Love the black and gold! Love your video. Beautiful card. I'm sure your Aunt as well as the recipient will love your card.